“After the pharmicist sends the boy to the doctor, he agrees to remove his eyebrow ring. Prior to the witch’s refusal to offer a remedy, his mother puts a stake in her womb. 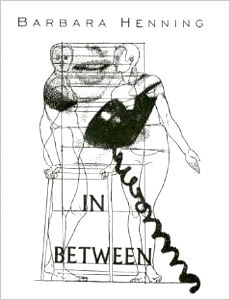 In the interim, tangled and indecipherable designs are tattooed on our breasts by big Teddy in Brooklyn.” Short texts are presented in between cover images by Miranda Maher in this short book by Barbara Henning.